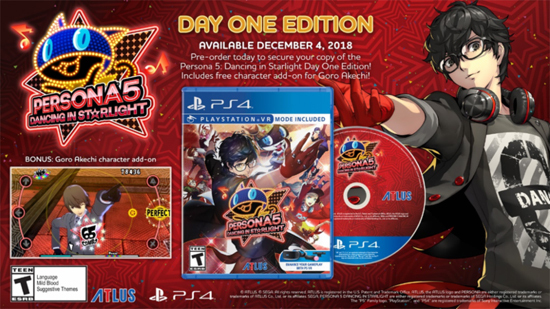 Persona 3: Dancing in Moonlight and Persona 5: Dancing in Starlight are launching on December 4, 2018! And good news for those who pre-order either (or both!) 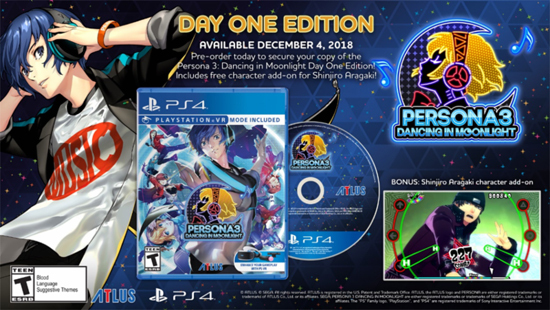 of the Day One editions: each features a fan-favorite Persona character you can add to your dance roster, along with their exclusive tracks! Day One Editions of Persona 3: Dancing in Moonlight come with the gruff SEES member with a heart of gold, Shinjiro Aragaki*! Shinjiro comes with the final boss theme of Persona 3 - Battle Hymn of the Soul. Day One Editions of Persona 5: Dancing in Starlight come with everyone's favorite pancake-loving detective, Goro Akechi*! Akechi comes with the pulse-pounding Persona awakening theme of Persona 5 - Will Power. Day One Editions of the Persona Dancing: Endless Night Collection for PS4 will include both Shinjiro and Akechi! Since the PS Vita versions of P3D/P5D and the bundle are digital-only and have no pre-order period, Vita players will be entitled to Shinjiro Aragaki (with Persona 3: Dancing in the Moonlight) and Goro Akechi (with Persona 5: Dancing in the Starlight) for free with purchase of the games within 2 weeks of their launch on December 4, 2018! *Both Shinjiro and Akechi, as well as their respective tracks, are available for use in both P3D and P5D. Pricing: Bundles are priced at $69.99 PS Vita $99.99 PS4 and are available on December 4, 2018. 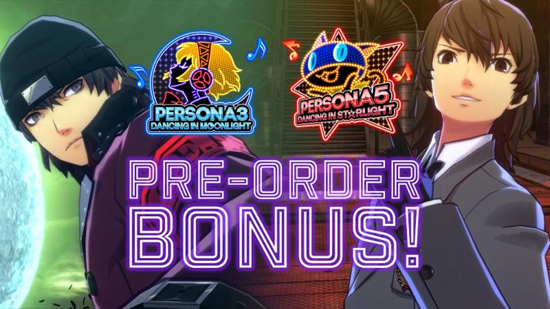 Persona 3: Dancing in Moonlight and Persona 5: Dancing in Starlight will be available standalone for $39.99 PS Vita $59.99 PS4, with commensurate European pricing. 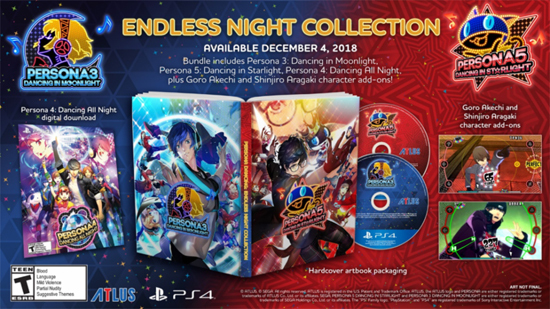 Pre-orders for each of the individual games and the Persona Dancing: Endless Night Collection are now available at https://atlus.com/personadancing/.